The Little Mail Carriers in Terceira, Azores! Blog > The Little Mail Carriers in Terceira, Azores! 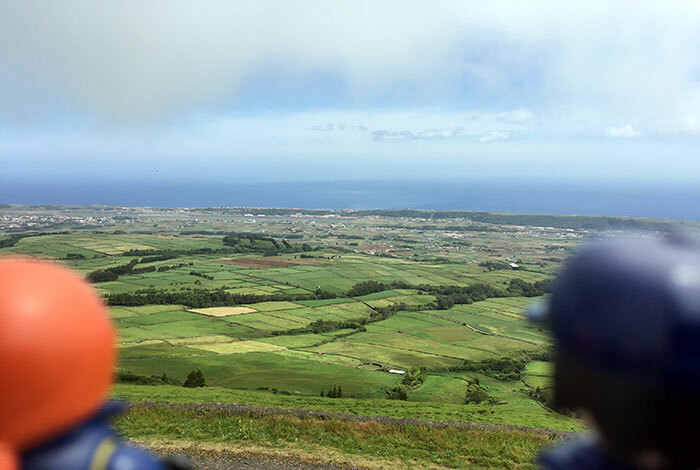 Continuing on their tour of the world, last year the Little Mail Carriers visited Terceira, a tiny Portuguese island in the archipelago of Azores. They were warmly welcomed by the local postcrossers, and discovered a land of mystery and delights, in the middle of the Atlantic Ocean. We’ll let them tell you all about it! Olá everyone! We tagged along big Paulo and Ana to attend a Postcrossing meetup in the Terceira island, in the Azores. Can you spot it on a map? It’s a luscious archipelago made of 9 volcanic islands, halfway between Portugal and the USA. Terceira (aka, the “third”) was so named because it was the third island to be discovered by the Portuguese. 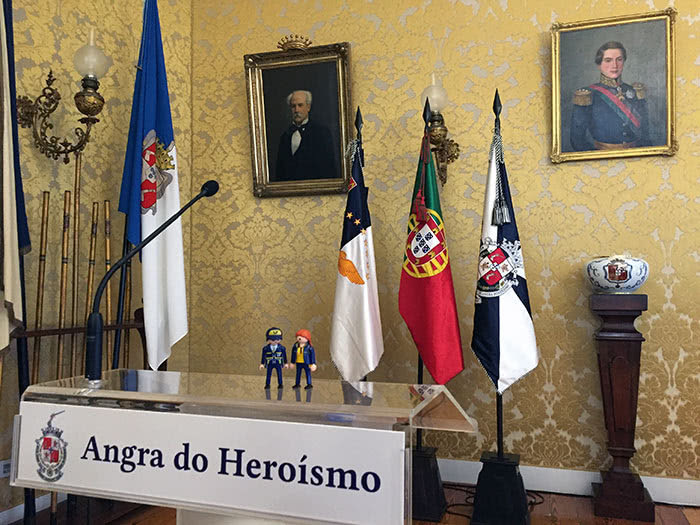 To kick off the meeting, we were received by Angra do Heroísmo’s mayor, who generously took the time to introduce us to the history of the island and its many stories, both historical and geological. Angra is after all a UNESCO Heritage site, for being an obligatory port of call of the fleets that crossed the Atlantic in the 15th century, and also a testimony to the maritime exploration that allowed exchanges between the world’s great civilizations of the time. We admired downtown’s architecture, and even met Vasco da Gama, an important Portuguese explorer, who first sailed the sea route from Portugal to India. On the way back from his first voyage there in 1499, his brother got sick and eventually died in Terceira, where the fleet stopped for some time to grieve and recover. From the geological point of view, the Azores are a very interesting place as they’ve got 26 active volcanoes (8 of which are underwater)! The islands straddle the mid-Atlantic ridge, with 2 of them being on the North American Plate. We could see a lot of evidence of this volcanic origin all around us, on the dark rocks that have been used for centuries in walls and even mailboxes! We had the adventure of a lifetime when we visited Algar do Carvão, the chimney of a very old volcano — now without lava, of course. Have you ever been inside a volcano? It’s magical! Volcanic signs are everywhere in Terceira: from sea pools made of cooled lava to sulfur vents that still send off their stinky gases today! One of the most curious uses for the volcanic rocks is to grow wine. The vines are planted among basaltic rocks, protected from the winds by low rock walls. Basalt heats up in the sun and slowly dissipates its heat, sweetening the grapes and giving them a unique terroir. After learning some geology, we visited a couple of big churches (rebuilt after the devastating earthquake of 1980) and learned about the islands devotion to the Holy Spirit. On the right of the photo below you can see a “Império” (or “Empire”), which are colorful mini-houses used as central points for the festivities of the Holy Spirit. There are dozens of such Impérios in Terceira, all uniquely decorated. During the Pentecost period, children are made “emperor” for a week with great pomp and circumstance. The processions and banquets involved in the celebrations bring the local communities together and are a treasured part of the island’s heritage. After touring Terceira, it was time to get together with the local postcrossers to write some postcards to all our friends. 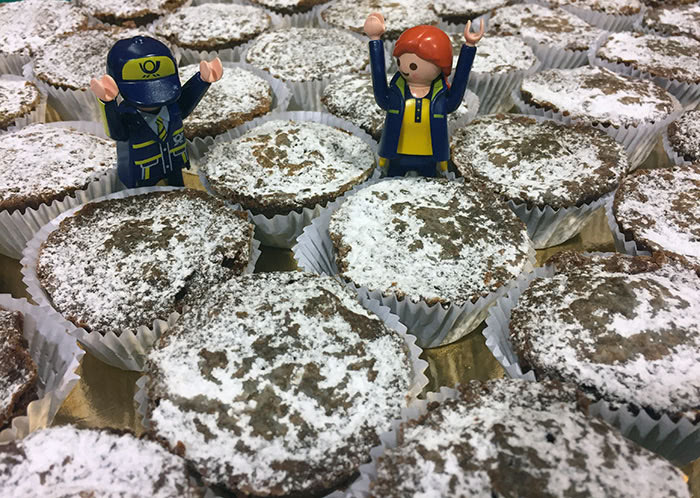 The locals were friendly and well-organized, and they put together a wonderful meeting, featuring lots of laughter and the local D. Amélias pastries which everyone loved! 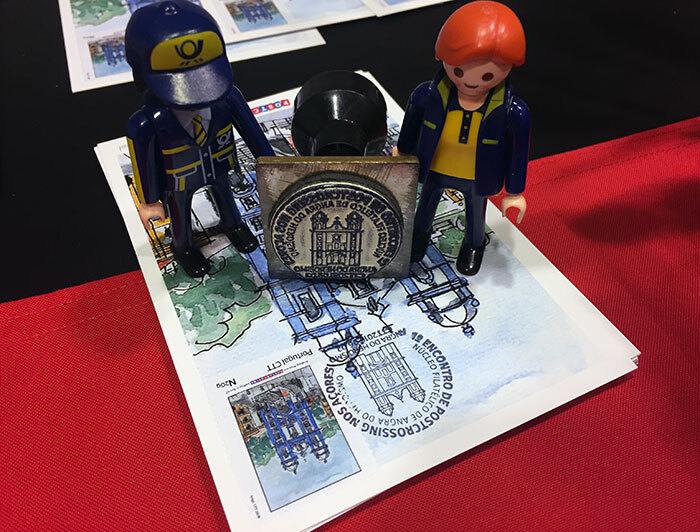 Lots of enthusiastic postcrossers (both from the continent and the islands) attended the meeting, and there was even a special postcard designed by a local artist, as well as a special postmark dedicated to Postcrossing to celebrate the occasion! Wonderful post! I love that postmark! Visiting the Azores is on my "volcanic islands" bucket list. So lovely. Thanks for sharing! I hope to visit the Azores one day! Thanks for sharing this. Brings back memories of my early teenage years, when my family lived on the island of Terceira for almost 2 years. Special place, special time. Amo esse lugar!! Ilha Terceira e seus Impérios. Pena que não soube carimbo quando estive lá. Mas vou voltar em breve! Lovely churches and very ornate Império. This is a place I have always wanted to visit and now even more so after this wonderful blog. I am sure everyone had a wonderful time at the meeting and it would be the absolute icing on the cake if I received an official postcard from this event. A wonderful account of your visit - thanks for sharing with us. I'd also love a card from the Azores - that would be special! I and my wife, we had the happiness to take part in this Postcrossing Meet-Up and to visit all those places in our Island territory. Thanks again to the local postcrossers who organized this unforgettable event and also to Terceira Island Mayor and local Postmaster. Beautiful postmark! Thank you for a great article! I'll never forget the way we were received. I was there and I feel those days are unforgettable. I truly recommnend a visit to that amazing island. I visited several islands of the Azores Arichpel more than thirty years ago. At that time there were still very few tourists on the islands and everything was still very authentic. You still had to look for the post offices and the choice of postcards was limited. For the landscape and nature an experience of a special kind and will always remain unforgettable. A wonderful post and an amazing location! Nice post thank you, what a lovely Iocation! Thank you so much for sharing this! When I first saw this, I gasped! Not many people have heard of Terceira Island, or the Azores for that matter. I lived on Terceira Island from 1990 to 1992. I was in the Air Force at the time. When I first arrived, I lived on base at Lajes AB, and later on, I moved to Vila Nova, a village on the north side of the island. I gave birth to my daughter while I was there. We left the Azores when she was 11 months old. Unfortunately, we have not returned since. I would love to take my daughter back to her birthplace someday. Although I understand much has changed due to the number of personnel at Lajes being reduced. It was great to receive all the postcrossers who came to our island Terceira. I hope you guys come back someday! and pastries to eat! What a cool tour. Certamente, uma visita muito gira. Lá vai um grande abraço. What a fascinating little world... it makes felleing like going there! Obrigada pelo descobrimento!! Great article! Azores Islands are a lost paradise on earth! One of the best places to admire and to live. I learned something today, and in a well put and enjoyable way. Thank you for bringing us along via a photo journey. May Prostcrossers continue to interact and learn from one another world wide. I wish some day I’ll visit this archipelago ! What a coincidence yesterday I watched a dokumentary about this lovely place Terceira Azores on TV. Today I read about on the Blog how crazy is that!!!!! A new place to discover in future. Thank you. We have spent wonderful holidays on Terceira and Sao Miguel last year. My mother-in-law family was between the first portuguese men on Terceira island but we haven't found their traces unfortunately. Thank you to share with us this colourful place. Anfra do Heroismo is fantastic ! On my first trip to Europe, our chartered flight (from Los Angeles, CA to Frankfurt, Germany) stopped in Bangor, Maine, and in the Azores. Except to land long enough for fuel, we didn't get to spend any time there. But, I'll always be grateful, since that time, to know these islands exist. It saddens me how few people have little knowledge or appreciation of their world's geography. Thank you for sharing your visit through the Postcrossing Blog. Perfect tour, with Postcrossing special postcard,stamp and sealing. What a nice time must these 2 have had. I really enjoy reading the articles about your adventures. Que passeio interessante! Adoraria conhecer! Muito legal! Hello, great photos. I would like to invite them to meeting 01.06.19 Kassel Wilhelmshöhe near the Unesco world heritage . I love that there was a special postmark made for postcrossers! Thanks for sharing such a beautiful place. Thank you for 'The Little Carriers', I have been reading the archives as well, my geography is certainly improving since joining Postcrossing. How beautiful! My grandparents were born on Terceira, Azores, and there are many of us of Portuguese descent in Central California! I hope to exchange post-cards with a pal from Terceira someday! Would love to host the mail carriers in Honolulu Hawaii!!! !